Visible crew/equipment: On the beach there's a battle charge, and in the foreground you can clearly see a set of tyre tracks from the camera vehicle preceding the charge. Continuity mistake: When one of the siege towers is rolled over the camera, you can see one of the pushers look for the camera and move to avoid it. Revealing mistake: In the scene were Charlton Heston has just said goodbye to Sophia Loren and is about to ride off with his followers (last scene just before the set intermission in the film), you can just make out a tiny little red automobile riding through the landscape in the background. Trivia: Michael Hordern plays Charlton Heston's father in the movie. In real-life, Hordern was only 12 years older than Heston. Moutamin: In my country, we have a name for a warrior with the vision to be just and the courage to show mercy. We call him... the cid. El Cid: Our dream was short. Jimena: I know. There is no place hidden for a man like you. There must be thousands who would gladly part. Why you? Why me? El Cid: Please, let me carry away an image of you smiling. Jimena: It would be a lie. I will beseech God with my prayers. I will tell Him He must bring you back to me. I must tell God how much I need you. 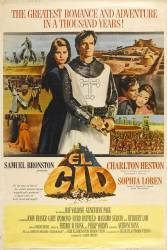 El Cid: Then we will see each other again. Moutamin: And thus the Cid rode out of the gates of history into legend.